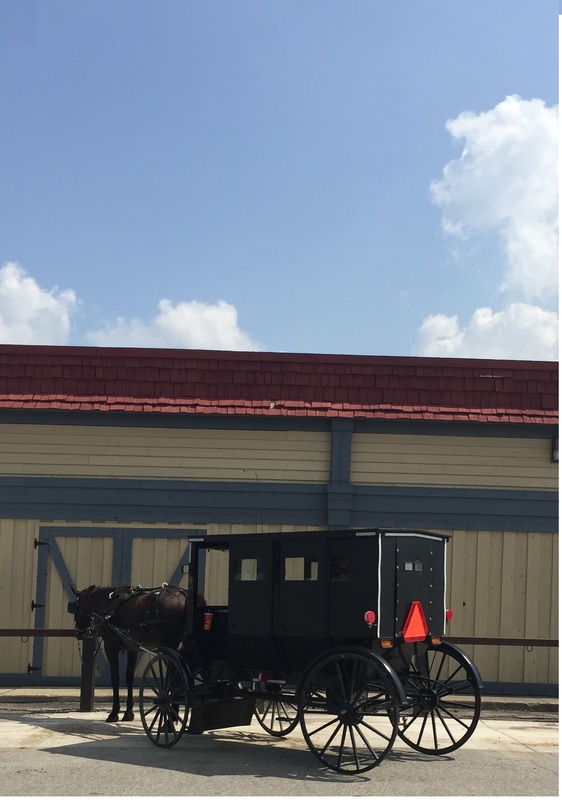 While at Amish Acres in Nappanee, Indiana, we had a rural Amish woman give us a tour of the only Old Order Amish Farm listed on the National Register of Historic Places. She allowed us to ask our curiosity questions and answered them with candor. She was a rural woman extraordinaire. I hung on her every word – I was impressed, intrigued, and honored to visit with her. Laura explained the food drying, smoke, and baking houses. 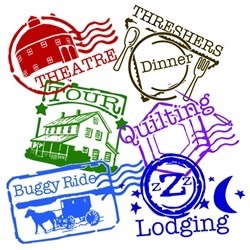 She toured us through the original house, the house after additions, and the children’s rooms on the second level. We then met and visited in what we would call a living room, where they would hold church. They started in Switzerland in 1525 and were first known as Anabaptists. 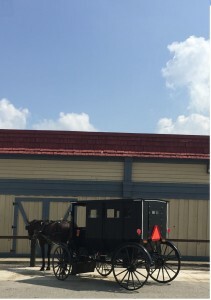 Amish are a branch of the Mennonites. Mennonites were becoming too worldly and the Amish wished to continue the Old Order beliefs. They speak Pennsylvania Duetch (Dutch) in their homes unless an English speaking person is in their presence, whereas they speak English. Laura spoke perfect English. They don’t baptize until a person can make his/her own decision to accept the religion. They were persecuted for over one-hundred years and they live in rejection and separation of the world that treated them so poorly. They yield their lives to a higher power, contentment, and a calm spirit. Nobody goes to school past the eighth grade. They have Amish schools and 99% of the teachers are Amish, meaning they only have an eighth grade education also. Leaders go from house to house and ask if the family has any young woman who would like to teach. All Amish men, after married, have a beard – no mustache, only a beard. No beard means they are not married. Women usually get married in their late teens or early twenties. They wear no jewelry – not even wedding rings. Birth control is not used – therefore, families are large. Laura came from a family of eleven. They do not drink alcohol or have cell phones. They go to a phone box that is down the road if they have an emergency. They have no electricity in their homes, but do have gas stoves and refrigeration. They have no electric washers or dryers. Each Church District (based on how many can gather in one house for church) has one Bishop, two Ministers, and one Deacon. All are chosen at random, but to be the Bishop one must first be a Minister. All are unpaid, and hold the position throughout their lives. Each church district decides its own rules – explaining slight differences or variances of rules in districts. Church is held every two weeks on Sunday and families take turns hosting. They do not have church buildings as they see that as following the culture that persecuted their ancestors. When they have church, women and children sit on one side of the room, and men on the other. It is not allowed to buy insurance. When one family in the church community needs help with medical treatment, the group pays the bills. If a tornado or fire, families come from miles around and rebuild the house or barn. Men construct the buildings and women provide food. If someone is employed in factories and medical insurance is included in the salary, it is okay to have insurance. They cannot own a car or drive a car, but they can ride in a car – for example, going to work. They have buggies, ride bikes, or walk. They now can have tires on their bikes. They cannot have motorized farming equipment, but they can hire someone to come onto their land with motorized equipment to farm or harvest for hire. Women must have their head covered at all times except when sleeping. The small white hair coverings are made by Amish women and are made of fabric. They must wear a black bonnet to church. Women all wear dresses that are one solid color, usually darker, and are held together at the neck with a straight pin. Young female children have buttons because of the danger of the straight pin. Women use very colorful fabrics for quilts, and have no restrictions on where they shop, just as non-Amish could. Men have no buttons on their jackets because that would represent military and they are a peaceful people. The military is again representative of the people who persecuted their people for so long. The men must register and can be drafted, but they are not sent into battle. They are given non-violent duty in the states. Based on the second commandment, (“Thou shalt not make unto thee any graven image…”) they take no photographs of themselves or others. 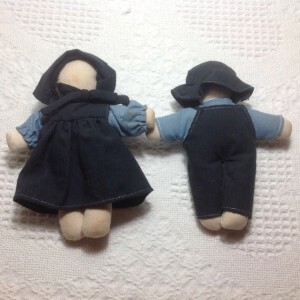 For the same reason, their Amish dolls have no faces; they don’t want a doll face to resemble a real person. They lose 5% (or less) of their young people to the outside world. Their population is increasing significantly and she attributes that to large families and children who choose to stay in the communities. It is not from outsiders choosing to join the Amish community. Laura was clear, transparent, and happy with her life. She made my day! I found this informative, didn’t know much about the Amish, but was always curious about their life style. Does the refrigerator run on propane, since electricty is not allowed in the house? (If so I didn’t know they still made them, we had one in Elba 267 years ago). I was always confused how some farms had powered equipment even though I understood they couldn’t have it, so thanks for the understanding. Also I see they do have a visual status indicator for men (beards /no beards) so wonder if they do have the curtains in the upstairs girls window tied back to indicate her status. ie available for marriage or not. Were the marriages arranged or is it self selection? In Ohio I always notice how neat the farm grounds and buildings appeared. Thanks for sharing your visit today. I found this informative, didn’t know much about the Amish, but was always curious about their life style. Does the refrigerator run on propane, since electricity is not allowed in the house? (If so I didn’t know they still made them, we had one in Elba 267 years ago). I was always confused how some farms had powered equipment even though I understood they couldn’t have it, so thanks for the understanding. Also I see they do have a visual status indicator for men (beards /no beards) so wonder if they do have the curtains in the upstairs girls window tied back to indicate her status. ie available for marriage or not. Were the marriages arranged or is it self selection? In Ohio I always notice how neat the farm grounds and buildings appeared. Thanks for sharing your visit today. Harold – I’m not sure about the refrigerator power source. (Umm…267 years ago…I don’t remember that. )She only said they have “gas” refrigerators, freezers, and stoves. Because each church community has the authority to change their rules, there are many different standards. Mennonites are a sect of Amish but they can drive and have electricity. She didn’t mention the young girls curtains. Marriages are not arranged, and they have social events with other church districts so young people can meet each other. I asked about cousins marrying and she said they really discourage first or second cousins marrying. Glad you enjoyed the little bit of info…I certainly did. Thanks too for visiting my blog! Are you sure that the Mennonites branched off from the Amish? I though it was the reverse. You will thoroughly enjoy reading Amish literature. Good clean reading and one learns so much about the Amish, their lifestyle… I have quite a collection of Amish literature thanks to my daughter who got me addicted about 25 years ago. a question on social workings, ( I appreciate you may not know, but maybe someone who reads your blog does. and will document the question at a minimum) How are those men who get hurt and can’t work taken care of ? Working with horses is usually when you get hurt, not if, and since they don’t have insurance, is disability the individual family or the community responsibility , and extending hurt on to being fatal how is a widow with several young kids supported? Can or do they remarry?